Everybody loves a Hot Shower! designed and warranted by America's oldest pump manufacturer. -Hot Jugz Showers will run for over two minutes on just 15-20 pumps. WARM or COLD for extended periods of time. 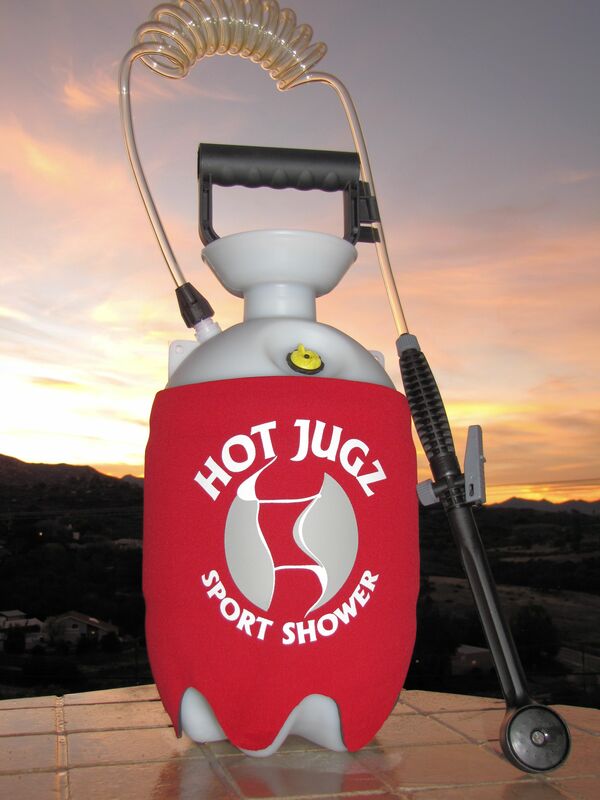 -Hot Jugz Showers weigh just 4lbs (2KG) making them extremely portable. -Hot Jugz Showers will keep water warm for up to 6 Hours (commando model). We tried the rest, then designed the best; a portable shower for surfing, camping and all your outdoor needs. Have the enjoyment of long-lasting, thermally insulated, portable hot showers anytime, anywhere without the hassles found in other poorly designed showers. "Hot Jugz" outdoor shower does not require 12-volt service, batteries, propane, cigarette lighter or a place to hang it. Just fill it up and you're on your way. We are so sure you will love it we offer a 100% money-back guarantee! For a YouTube Demo - Click Here!